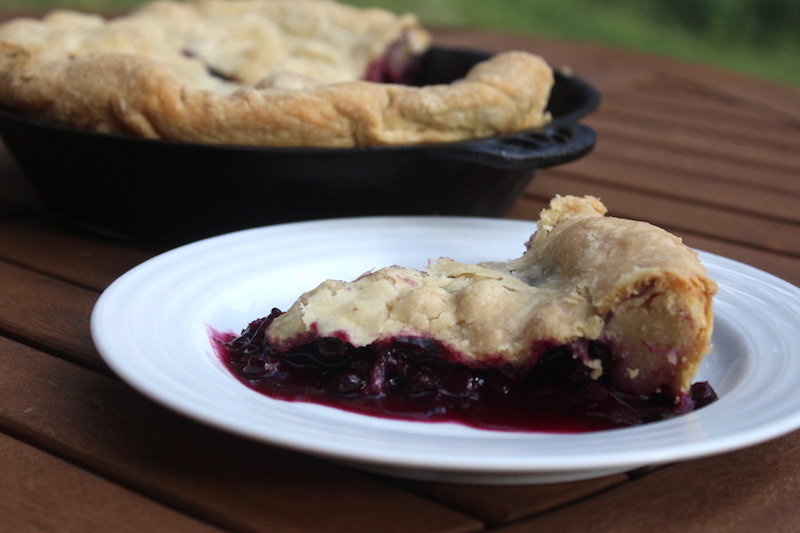 Homemade blueberry pie with fresh blueberries is one of the simple joys of summer. Bake it indoors, or get adventurous and bake it outdoors in a dutch oven to keep the house cool. 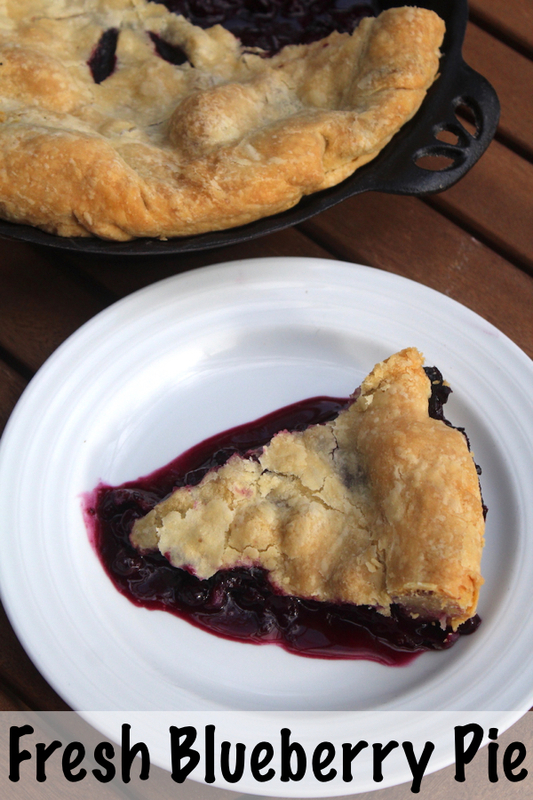 Either way, a savory butter crust is a perfect complement to the juicy blueberry pie filling. I use a simple four-ingredient pie crust with just flour, butter and a pinch of salt. Dust it with sugar to caramelize the outside, or add a few tablespoons of sugar right into the crust for a sweeter taste. I actually love a bit of a savory crust, like a flakey biscuit to compliment the sweet fruit inside. Regardless of the crust recipe, it can be tricky to keep the bottom crust from getting soggy. 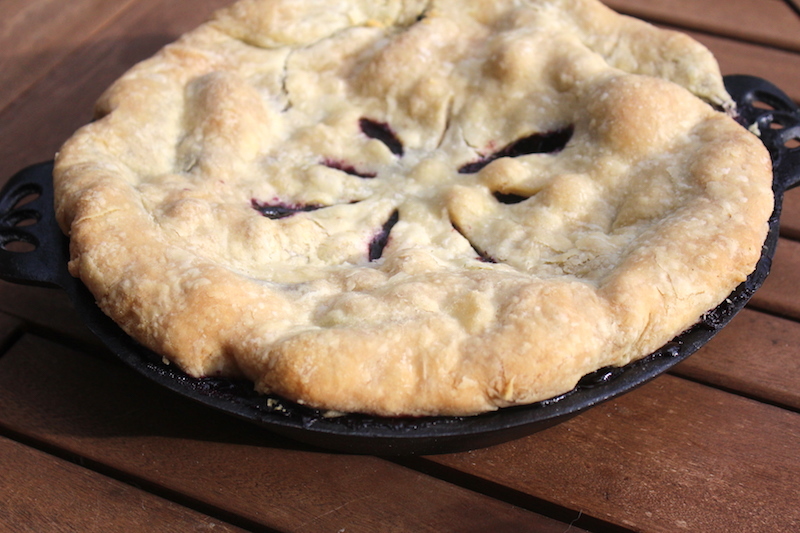 The absolute best way to create a crisp bottom crust is to bake the pie in a cast iron pie pan. The extra heat conduction cooks the crust before the fruit has a chance to make it soggy. Fresh blueberry pie, unbaked and before milk glaze. The extra flour on top of a pie crust can lead to a dull finish on the cooked pie. Use a silicone pastry brush to brush on a light coating of whole milk and the finished pie will have a beautiful golden color. The pie needs to be fully cool before cutting if you want to take out a clean slice. That never happens in my house, as the little ones clamor around begging for it to be cut seconds after it comes out of the oven. This time I made this pie as a special present to my mom, since fresh blueberry pie is her favorite. Instead of the little ones begging for a hot slice, I had my mother instead. What can I say, we all come by it honestly? 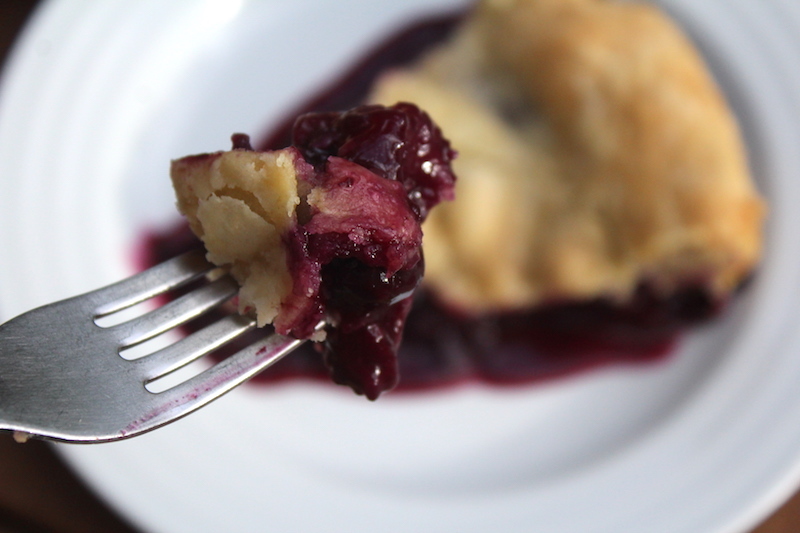 Fresh blueberry pie is simple to make at home with just a few ingredients. To make the crust, mix the flour and salt and then cut in the cold butter. Use a pastry cutter or a pair of butter knives to chop the cold butter into pea-sized pieces. Add water, a bit at a time, and mix until the dough just comes together. Divide the dough into two halves and refrigerate until needed. Mix the pie filling ingredients together in a bowl and set aside. 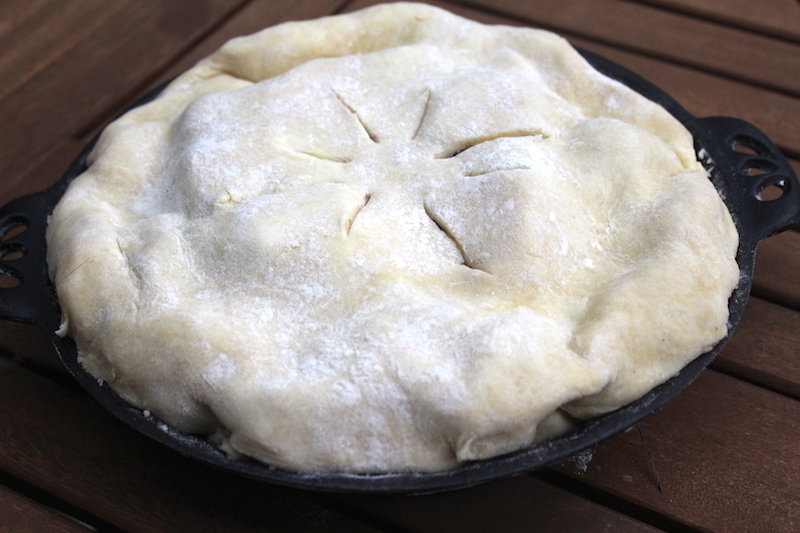 Roll out the pie crust and line the bottom of a cast iron pie pan with one circle. Pour the blueberry pie filling into the prepared crust. Add the top crust, and use a pastry brush to apply a thin coat of milk to the top crust. Slit the pie crust with a sharp knife to vent. Bake at 425 for 30 to 40 minutes, and then turn the oven down to 350 for the final 30 minutes of bake time. The pie is done when the filling boils through the slits in the top crust and the pie crust is browned.